I like to provide an assortment of healthy snack options for my kids. I have been very fortunate that my kids love fruits and vegetables, but they also like treats. Yogurt is one of those treats - something that they enjoy that I can feel good about giving them. Recently, we had a chance to try Simply… Go-Gurt. It is made from "simple ingredients and contains no high fructose corn syrup or artificial colors or flavors. Each convenient portable yogurt tube contains a good source of calcium and vitamin D. Simply stated, Simply… Go-Gurt is a good-for-you, low fat yogurt snack that you can feel good about giving to your kids". New Simply… Go-Gurt is available in two flavors, Strawberry and Mixed Berry. At our house, we like to enjoy our Go-Gurt two ways - refrigerated and frozen. One advantage of frozen is that the yogurt is less messy - trust me, my three year old is able to squeeze juice boxes/pouches and tube yogurt in just the right way to create a mess - when it is frozen, this doesn't happen. When we freeze it, the kids think of it as a popsicle - only it is one that is packed with more nutrients than the standard popsicle. Freezing them also makes them very easy to pack in my son's lunch or for his school day snack. 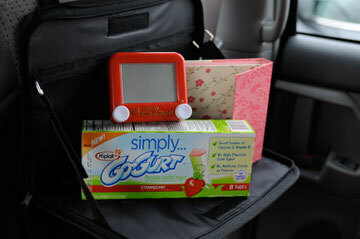 By lunch or snack time, the yogurt is not fully frozen, but it is still cold and allows him a treat at school. I also like to freeze them and pack them in the cooler for road trips. It gives us an easy to consume snack on the road. The link above is loaded with great tips and 30 free coupons. The first 30 readers who click on the “Try It Free” tab will receive a coupon for a free package of Simply…Go-Gurt! * Once the 30 coupons are claimed, you will still be able to print a coupon to save $1.10 off Simply... Go-Gurt. Courtesy of Go-Gurt and MyBlogSpark, I have the opportunity to offer one A Busy Mom of Two reader a Go-Gurt “Simplify Your Life” prize pack that includes a pocket Etch a Sketch, weekly planner and a seat back organizer. To enter, leave a comment sharing your child's favorite wholesome snack foods. 1. Subscribe to A Busy Mom of Two by e-mail or RSS feed (on my sidebar near the top). Leave me a comment letting me know that you subscribe. If you are already a subscriber, let me know that too - this isn't just for new subscribers. 2. Follow me on Twitter and Tweet about the giveaway and leave a comment with a link to your Tweet. This entry may be completed once each day. 5. Leave a comment on another post. Then leave a comment here, letting me know. The giveaway will remain open until May 3rd at 6 pm. Winner will be selected using a random number generator. The winner will be contacted by e-mail (be sure to leave one!) and will have 48 hours to respond or a new winner will be selected. No compensation was received for this post and all opinions expressed are strictly my own. I did receive a coupon for a free pack of Simply... Go-Gurt and a Simplify Your Life prize pack courtesy of Go-Gurt through MyBlogSpark. In addition, they provided the prize pack for this giveaway. My daughter loves bananas & raisins as an afternoon snack! I would love to win this! We will be going on vacation quite soon! My kids fav snacks are fruit, yogurt(I rarely buy go-gurt because of the cost but they think that's the best;), & cheese sticks. My kids love dipping fruit in yogurt. They love sliced apples dipped in peanut butter, caramel or yogurt. I am a subscriber by RSS. We love fresh fruits and veggies. My son almost devoured a pound of strawberries the other day. My niece and nephew love ants on a log--celery with pb and raisins. My kids love frozen gogurts. We recently stuck popsicle sticks in the new small danimals cups for frozen popsicles. Yum! My son loves bananas! He also loves a bit of yogurt added to his oatmeal! My kids love yogurt and granola bars! Our kids love any fruit, cheese, or yogurt for a wholesome snack! Celery with peanut butter is a wonderful & healthy snack!